Best known as an item for a Chinese luncheon dish and one of many varieties of "Dim Sum" (Cantonese). Translation: "Bits That Touch The Heart". 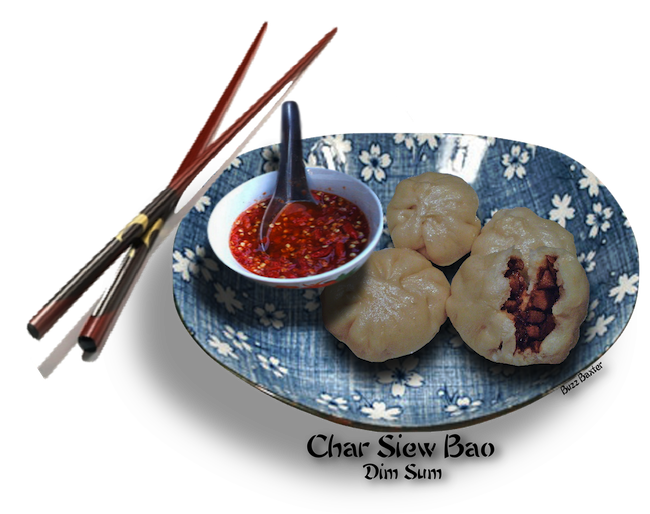 One of the many dishes you will be offered for a "Hong Kong" style Chinese luncheon where the items on the menu are collectively called "Dim Sum". Here you will find hundreds of Dim Sum aficionados gathered in large dining rooms, and ladies with push carts almost screaming out names of the dishes while hawking some of the most delightful morsels of Chinese steamed, fried and baked items for you to try. These delectable morsels are served on small individual plates with usually 3-6 of the same items on each plate. Each plate has a price coding or color marking so the young ladies (waitresses) will know at the end of your lunch, just how much each plate was worth and what the final total of the bill will amount to. The beauty of this is you can just keep ordering small plates of Dim Sim to your hearts delight. Surprisingly, the final bill is usually much less than you would imagine. yeast mixture. Add 3½ cups flour. place. Cover with damp cloth. Let rise until double in bulk, about 2 hours. roll 12 inches long and 2 inches wide. Cut into 12 pieces (24 total). 5. Flatten each piece with palm of hand. Roll with rolling pin into 3 inch circles. becomes a half moon. Crimp edges tightly with fork. to double in bulk, about 30 minutes. Remove towel. plastic bag and re-steam 10 minutes. 2. Heat 2 tablespoons oil in wok. Stir fry scallion and garlic 30 seconds. Add pork. Stir fry 1 minute. Add soy sauce, oyster sauce, and sugar. 3. Pour in dissolved cornstarch. Stir fry quickly until pork is glazed. Remove to bowl and allow to cool. 5. Slice the roll crosswise into 1 inch pieces. 6. Flatten each piece with the palm of your hand and roll with rolling pin into 3 inch rounds. 7. Place 2 tablespoons of filling in center of each round. 8. Gather dough up around the filling by pleating along the edges. 9. Bring the pleats up and twist securely and firmly. hour, until dough springs back when touched with finger. Remove towel. 11. Steam over briskly boiling water 10 minutes. 12. May be prepared in advance. May be frozen. Thaw out in plastic bag and resteam 10 minutes. Parchment paper can be used instead of foil. Parchment paper is more esthetic when presented on a plate. How to Make Chinese Steamed Barbecued Pork Buns ✯ Watch more Videos at Vodpod.